The Cherokee Heritage Center is located in Tahlequah, Oklahoma. It is the premier cultural center for Cherokee tribal history, culture, and the arts. It includes Cherokee National Archives and the Cherokee Research Center. The Cherokee Heritage Center was established in 1963 by the Board of Trustees of the Cherokee National Historical Society to preserve and promote the Cherokee culture while sponsoring dynamic educational programs, reconstructed historic villages, engaging exhibits, and scholarly research stimulating interest in the Cherokee people. 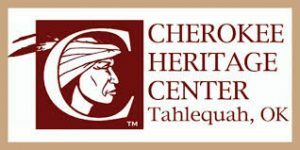 The Cherokee Heritage Center is the repository for the Cherokee National Archives, which is the Nation’s foremost collection of historic tribal related documents and artifacts, cataloging the rich history of the Cherokee people from the 1700s through today. It is home to the Cherokee Research Center, which assists Oklahoma Cherokee descendants to reconnect with their lineage. The Cherokee Research Center is on the National Register of Historic Places. It is located on the grounds of the famous Cherokee Female Seminary, one of the first institutions of higher learning for women west of the Mississippi. Cherokee Nation Services: Assists people who have Cherokee tribal citizenship. Seminary Records: Includes a list of names of Alumnae from before the Civil War, and also from after the Civil War, and every year after that through 1905. Cherokee Cemeteries: Information about Watt Christie Cemetery and a list of who is buried in each plot in each row. First Families: Information about eligibility requirements for First Families Membership, and instructions on how to apply for it. DILIGWA – 1710 Cherokee Village: It opened on June 3, 2013, on the historic grounds of the Cherokee Heritage Center. The outdoor living exhibit provides guests with an enhanced experience of authentic Cherokee life and history. The village is based on life in the early 1700s. Trail of Tears Exhibit: This is a permanent exhibit which explores the forced removal of Cherokee ancestors from their indigenous territory to the “Indian Territory”, present day Oklahoma. In addition, the Cherokee Heritage Center has events and offers cultural classes. Visit their website to find out what has been scheduled, the date and time of the activity, and the cost of attendance.